Recently a regular reader from my the other kitchen blog email me about my Malaysia spicy fruits salad (rojak) sauce recipe. 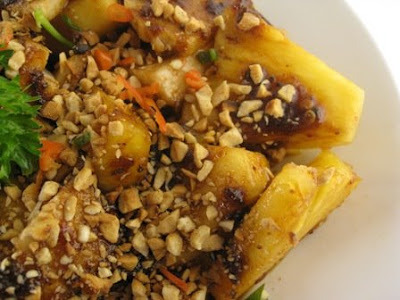 She try to follow my rojak recipe twice , check it here!! Unfortunately both her attempt failed . Her email prompted me to re-make and re-write my special rojak sauce again in this blog.The key to have great rojak is the SAUCE!! Remember my previous post perfect cut pineapple ? 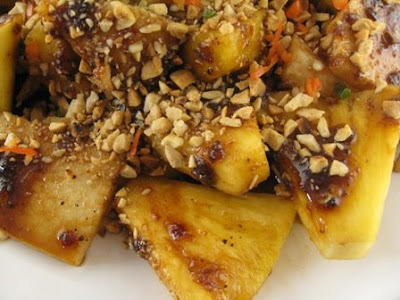 I'm using the cut pineapple and mixed with other fruits to make spicy fruit salad (rojak)!! it's really taste succulent good!! Bring back my yesteryear's memory when I was in Malaysia!! 2 tbsp sticky shrimp paste (har ko) must have!! 3 tbsp of caramel black thick sauce (I use Yuen Chun brand) don't use the regular thick soy sauce,it's smell raw!! 2: Use a clean spoon each time you want to scoop the sauce out.Store the remaining sauce in fridge.Shelf life is about 6 months to a year..
3:Prepare your favourite cut fruits in a plate,add rojak sauce one spoon at a time into your salad.Then sprinkle with roasted crushed peanut on top before serving. 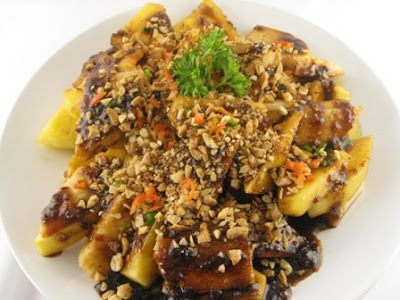 Pineapple and cucumber are fruit which contains higher liquid than others fruits or vegetables.So it's advisable to consume the salad (rojak) immediately after mixing with the sauce. Add peanuts when you're ready to eat to prevent the peanuts from getting soggy. I AM going to try it again! 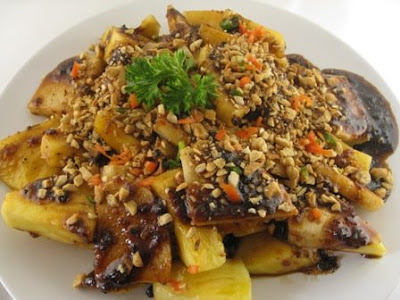 Rojak is my favorite snack dish. Do you know how to make the shrimp cracker that come along with the dish???? Thank you. Delicious! I wonder why I never thought of making rojak when I have abandon of pineapple (when it's on sale for $1 each), *scratching head*! This is Diana's favorite. I think I should preapare it for her when she comes back this weekend with the rojak sauce I brought from home. I have to learn to make my own rojak sauce. Thanks for sharing the recipe, Lesley. $1.00!! cheap!! cheap!! get some to make rojak!! you won't regart it! yes,Gert try to make this yourself I'm sure Diana will love it!..you can add more "lui" and more satified in a way! Inf act yesterday I just bought another bottle caramel thick sauce...going to make this sauce another !! 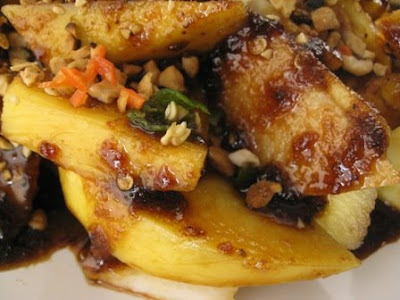 My mouth is salivating....your rojak looks yum! Now, I am thinking of making it this weekend with girlfriends who are coming over to cook some Msian food. I wonder what brand of petis udang you get in US? The one I bought (see picture on post) is not very dark at all and quite sweet. I remembered it was almost jet black and very thick of the one I got in the far east.